Ryanair has promised to publish details by end of tomorrowof all the flights it plans to cancel over the next six weeks following a passenger revolt, a slump in its share price and an expected compensation bill of £30m. The airline said on Twitter that “Between today and tomorrow all flight cancellations up and until OCT31 will be communicated.” Furious passengers had been swamping the airline with demands to know if their flight was among the 40-55 the airline said it would cancel every day over the next six weeks. Initially, Ryanair was only making available lists of cancelled flights up to this Wednesday, 20 September. Ryanair took to Facebook to blame rostering problems for the delays. “We have messed up in the planning of pilot holidays and we’re working hard to fix that,” it said. Reports in the Irish media suggest that Ryanair has begun offering pilots a €10,000 (£8,800) “signing-on bonus” to join the airline. Shares in Ryanair fell by 3% in early trading, knocking more than £500m off its £18bn stockmarket valuation, although losses were pared back in later trading. 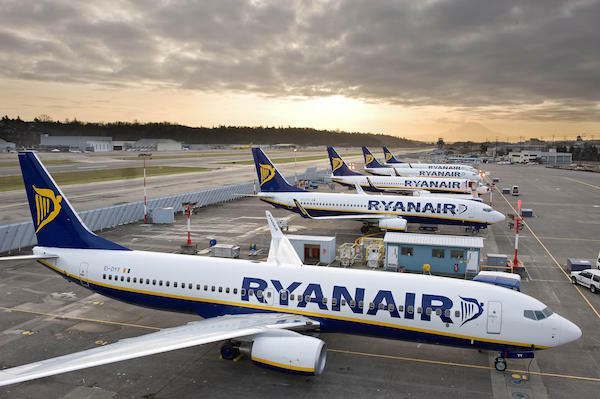 The airline said it expected to face a compensation claims of up to €20m, while analysts at Dublin-based Goodbody Stockbrokers said the final bill was likely to be €34.5m (£30.4m) as they marked down Ryanair’s full-year profit forecast by 2.3%. The threat of cancellations sparked fury among passengers, as millions were left in limbo, unsure whether their holidays plans would take off or not. Many took to Twitter to express their disgust over how Ryanair was handling the issue. One user said she feared for her wedding, with 30 Ryanair flights booked for her party, while others said that even if their outbound flight was not cancelled, they could not be sure if their inbound flight would be. Ryanair’s usually combative boss, Michael O’Leary, was widely mocked on social media for failing to speak, although the airline hurriedly arranged a press conference for later in the day. Investor groups said that while Ryanair usually brushes off poor publicity, in this case it could seriously hit the airline. “Ryanair is notorious for not caring about what sort of headlines they get, working on the basis that all publicity is good publicity – but not this time,” said Rebecca O’Keefe of Interactive Investor. “Previously, the carrier was happy to suggest that you get what you pay for and despite negative press lots of flyers embraced the fact that they knew the score and were happy to fly without the frills.